Villages are being razed in Rakhine State bordering Bangladesh as the Myanmar government steps up nationalist rhetoric. Yangon, Myanmar - The suffocating smell of charred wood has followed 19-year-old Ahmed for days. On Saturday, a group of armed men set fire to his home village of Ywa Thai Kay. With flames licking his heels and the sound of bullets cutting through the air, Ahmed, who spoke under a pseudonym, was forced to flee his childhood home, desperately clutching his most prized possessions - his English books. Five days later, Ahmed is again facing the threat of arson, this time in the remote village of Myoma Kayin Dan where he and 2,000 other unarmed Rohingya civilians have sought refuge after losing their homes. Surrounding villages were burning on Wednesday. "There is a big river behind this village," said Ahmed in a phone interview. "The women and children will not be able to cross it. We are so worried because we are trapped between the river and the military with no food to eat." He continued: "If they start to burn this village, then we will all be in trouble; we have nowhere to go." 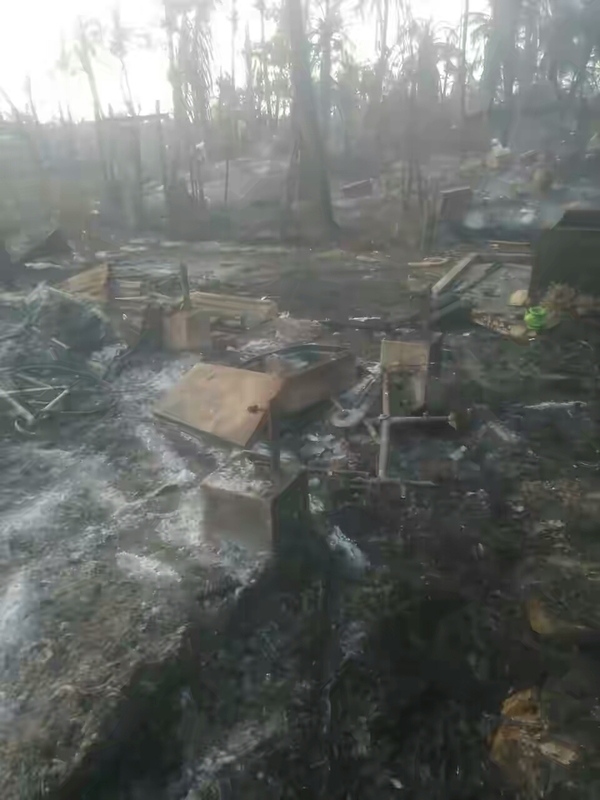 According to satellite imagery collected by Human Rights Watch (HRW), at least 10 areas over about a 100km stretch in northern Rakhine State, which lies in the country's west on the border with Bangladesh, have been razed over the past five days. 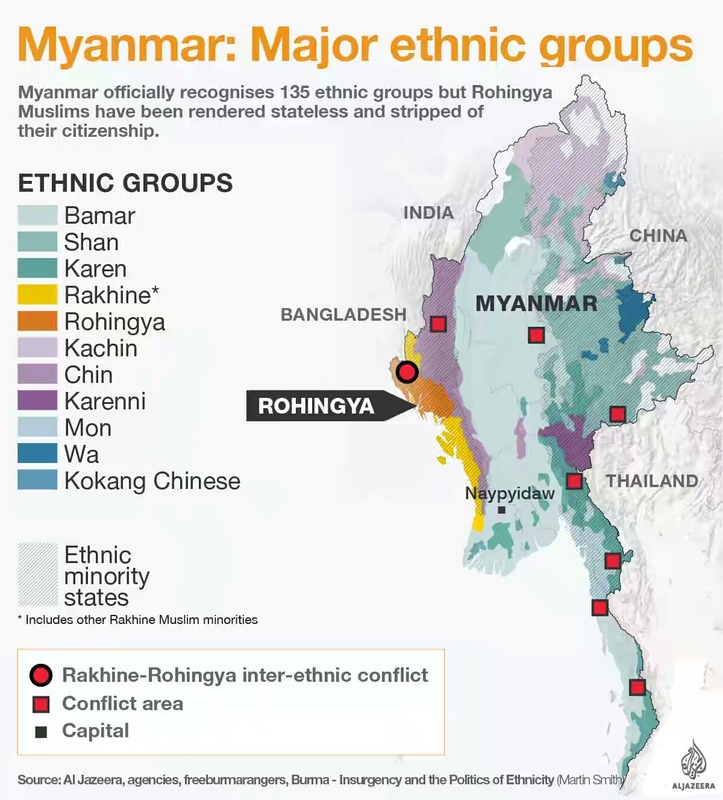 "There is no ARSA here," Ahmed said, referring to the Arakan Rohingya Salvation Army, the ethnic armed group which launched a series of attacks against dozens of government checkpoints last Friday, in which more than 70 were killed, including 12 security officers. "We informed the military that there are no fighters here, that they can come check for themselves, but instead they are firing their guns at us and burning down our houses … we don't have anywhere to go, everyone is distressed and people are trying to commit suicide," he said with despair. At least 109 people have died in the military operation and clashes that have followed last week's attack. According to the government, most of the victims are Rohingya fighters although members of the security forces and civilians are also included in that figure. In the past week, nearly 50,000 Rohingya Muslims have been on the run from the violence. About 27,000 of those fleeing have crossed the border into Bangladesh, while 20,000 are trapped in a no man's land between two nations, according to UN sources, Reuters reported Thursday. The bodies of 20 Rohingya women and children were today recovered from a capsized boat by Bangladeshi border guards.